This post started life as a comment. Back in 2007. Originally the links in the comment went to a site called fotopic.net which ceased operations in 2011. So I went to my flickr stream to see if I could find similar illustrations. The pingback was to this post and was from this article . It is nice to see that old stories from this blog continue to have some utility. And now this new post can be the source of reference to the old article and my comment under it. 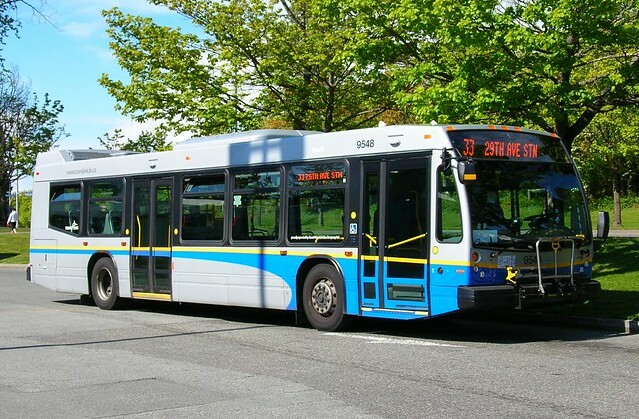 For a while Translink had plain white buses: this was for buses ordered in the period of transition from BC Transit, before the new blue and yellow livery was decided on. 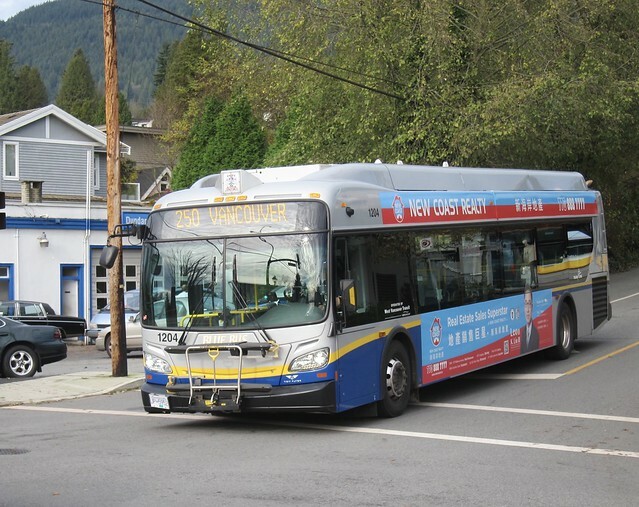 Many remained in service in the old red, white and blue of BC Transit. Note that black paint has been added to to window pillars and on the upper part of the doors. 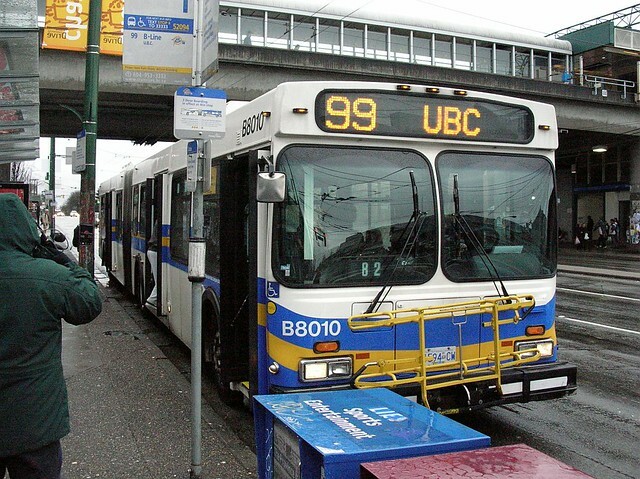 This was peculiar to the Vancouver transit system and was not added to BC Transit buses operating elsewhere. 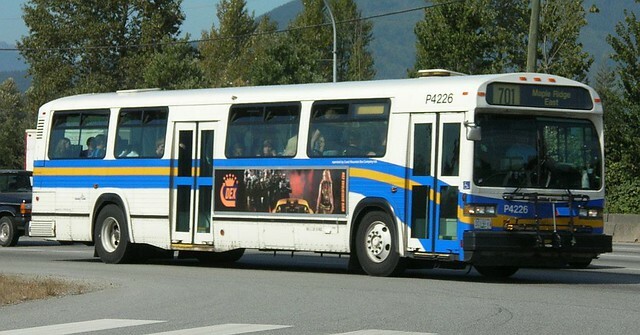 This was the standard livery in Translink’s first iteration. 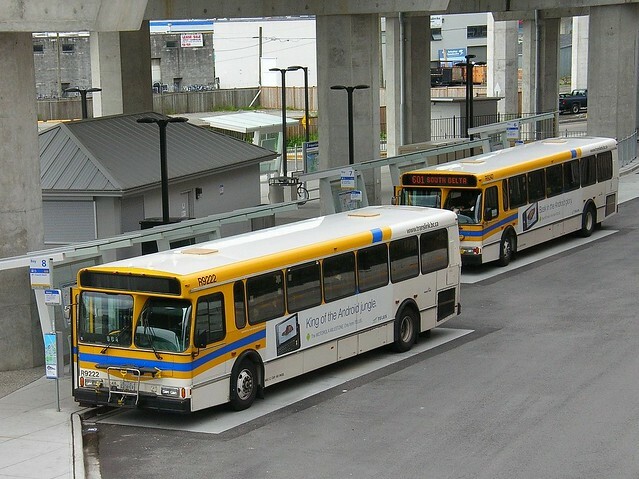 As the fleet went through its usual maintenance cycle the older buses were repainted white with a blue and gold set of stripes. 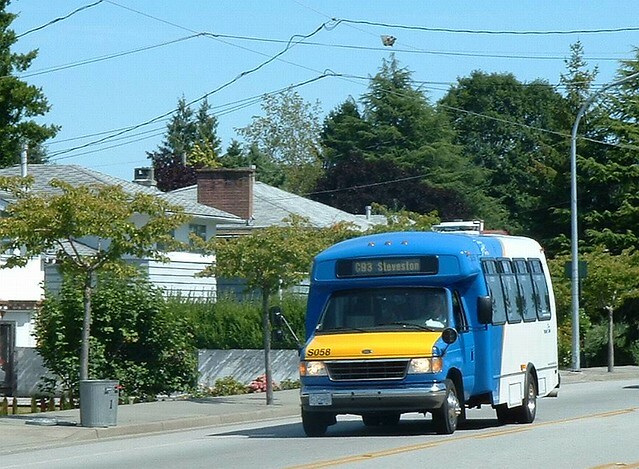 Community shuttles had a variation on the paint scheme. 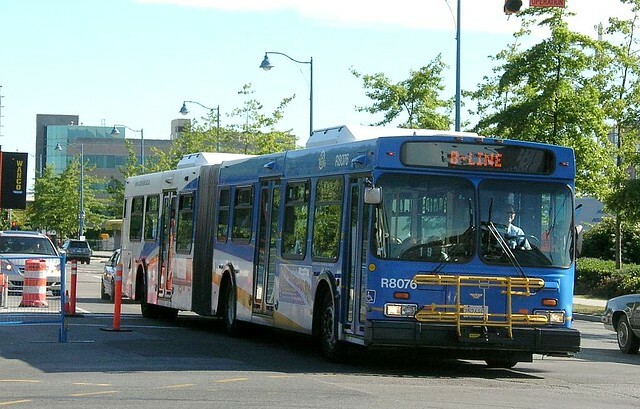 The B Line had its own variation, with a blue front to help intending passengers spot the difference from regular services. 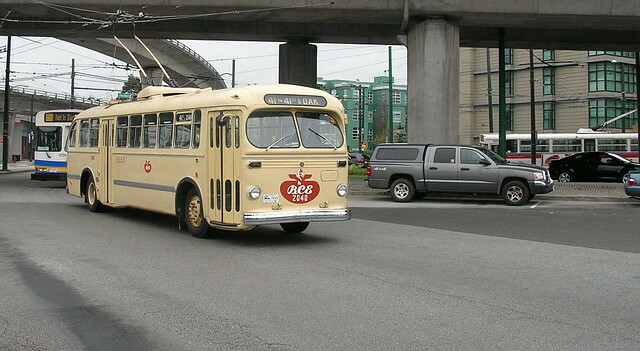 This was very similar to the BC Transit B Line livery, which had a red rather than the gold swoosh. 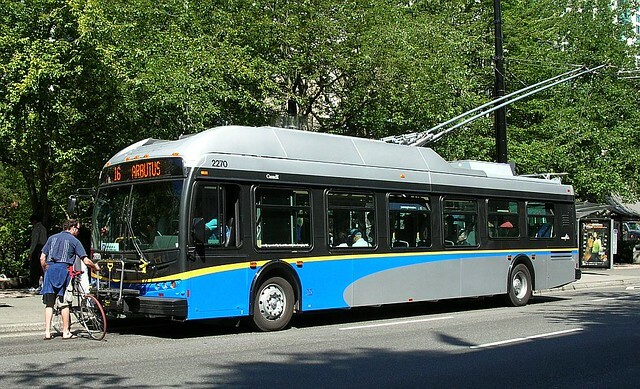 When the new trolleybuses started being delivered they carried this new black and grey livery with the blue stripe converted to a swoosh and the black being expanded on the front and onto the upper panel – not just the window surrounds. 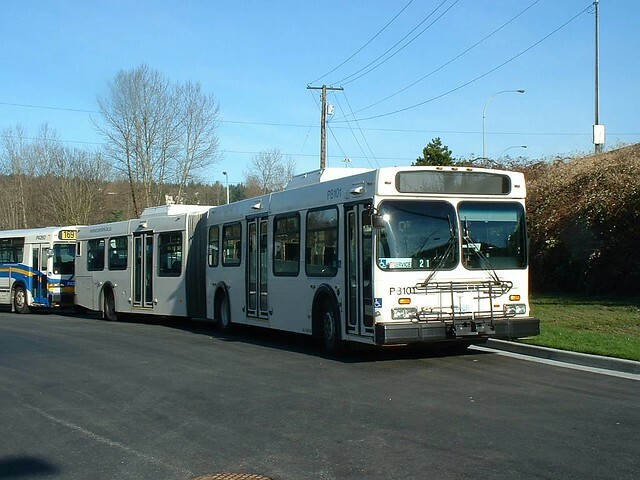 New diesel and natural gas buses were similarly treated. 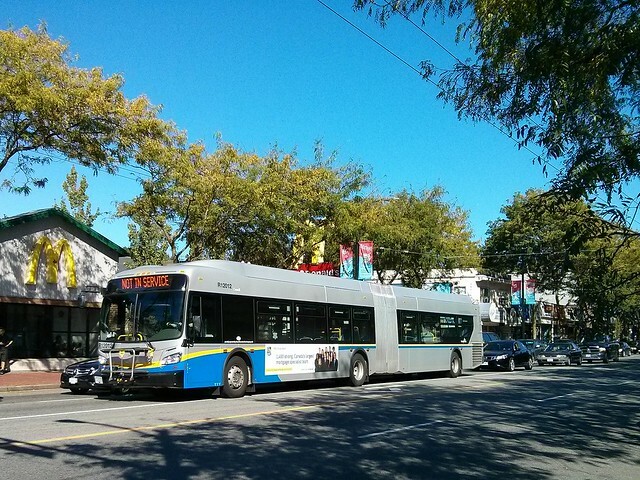 The Novabus did not get nearly as much black paint as the New Flyers, and I think looks the better for it. 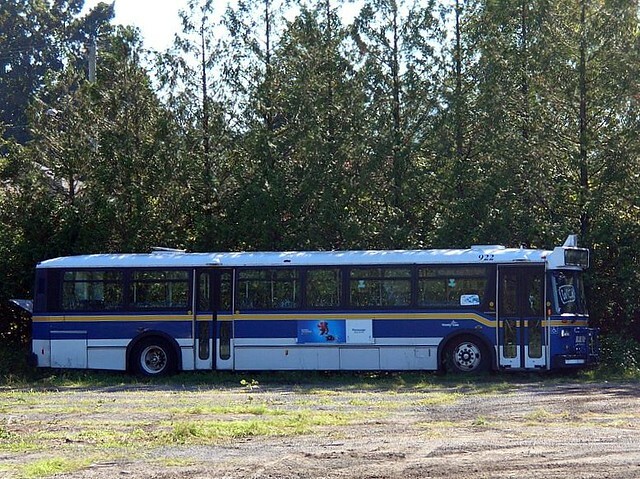 The high floor Orion highway coaches used on the express routes got their own yellow livery. This is the first version. 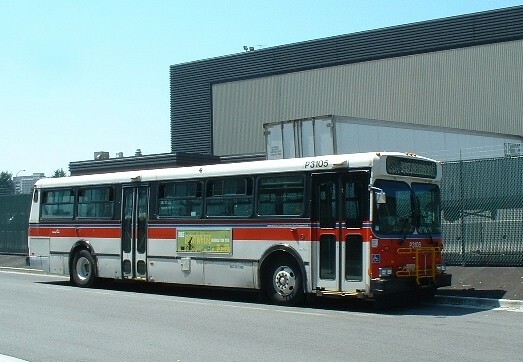 Later versions have grey on the lower panel. 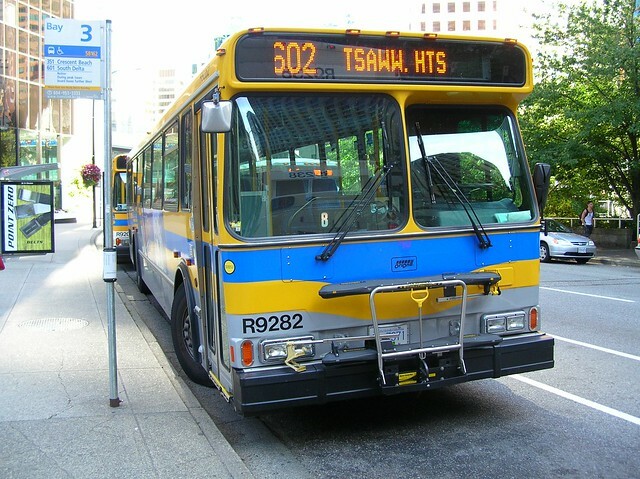 This one was photographed at Burrard Station: the introduction of the Canada Line saw these services cut back to Bridgeport Station in Richmond – which is where the previous picture was taken. The most recent variation has also reduced the amount of black paint with grey on the front and sides and is, to my eye, more pleasing. 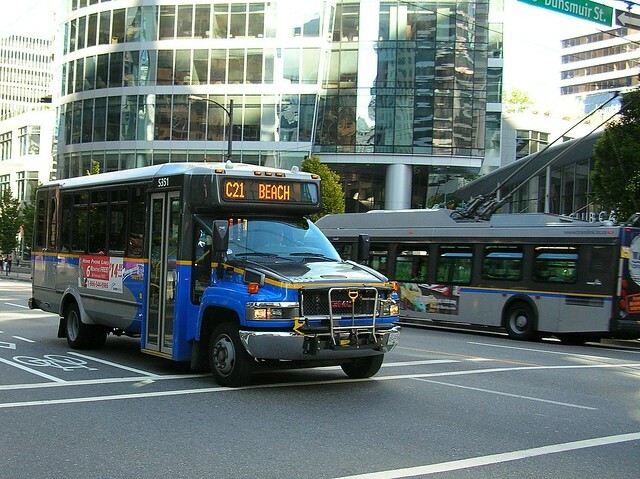 This was a variation used in West Vancouver for a while. This is what they use now. There is so little blue visible that the words BLUE BUS have to be added above the bike rack in large, friendly capital letters. 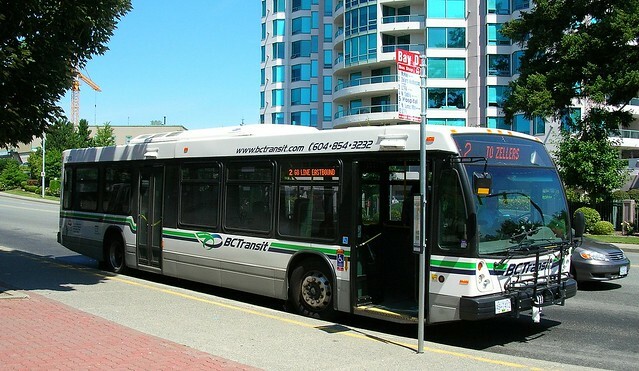 BC Transit now uses this livery instead of the old red white and blue. 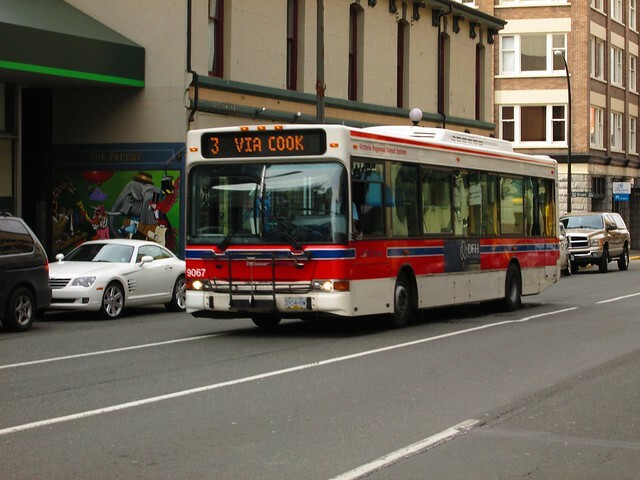 Though in 2015 it could still be seen in Victoria – here on a British built Transbus (Dennis) Dart Plaxton Pointer delivered in 2000. And I think this one may be earlier. 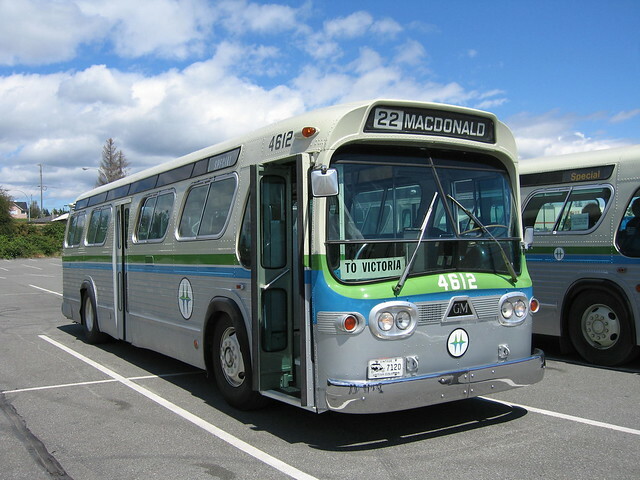 I am told that in the bad old days buses got repainted with each change of government into the colours of the ruling party – but that can’t be true can it? Now she is asking Prime Minister Trudeau to ban the export of thermal coal. No matter how he responds, the public now expects the B.C. Government to stop plans of Fraser Surrey Docks to export US thermal coal. The reason for the largest, most expensive bridge ever built in B.C. is to remove the George Massey Tunnel, dredge the Fraser deeper and facilitate export of US thermal coal through Fraser Surrey Docks. Plans also include transport of dangerous jet fuel and LNG on Panamax vessels and LNG carriers on the Fraser for the first time in history. As Canada has no effective laws, these projects do not meet international safety standards. With no need for coal freighters, the public should demand that the B.C. Government revive the original plans to upgrade the George Massey Tunnel and build a second tunnel by immersing a second tube. This would be cheaper, faster, and safer. “… politicians (other than all local mayors except one) simply have done little to challenge this $3.5 Billion boondoggle when another tunnel at less than 1/4 the coast is the best alternative to protect the fragile lower Fraser River. The issue is mainly about building a bridge that will allow large freighters and tankers up the river after the tunnel is removed and that will be a very large nail into the coffin of the Lower Fraser in that it will be followed by Port Vancouver’s grandiose plans to industrialize the estuary and lower river. However, a FOI request from Voters Taking Action on Climate Change revealed that from 2012 to 2014, the B.C. Liberals had ongoing discussions and correspondence with the federal government, the Port of Vancouver, Fraser Surrey Docks and vested interests. The challenge this week opens with “Have you traveled anywhere exciting lately?” Well yes and I have been posting pictures of Cuba for a while now. That was our most recent trip. In October 2015 we were much further from home. 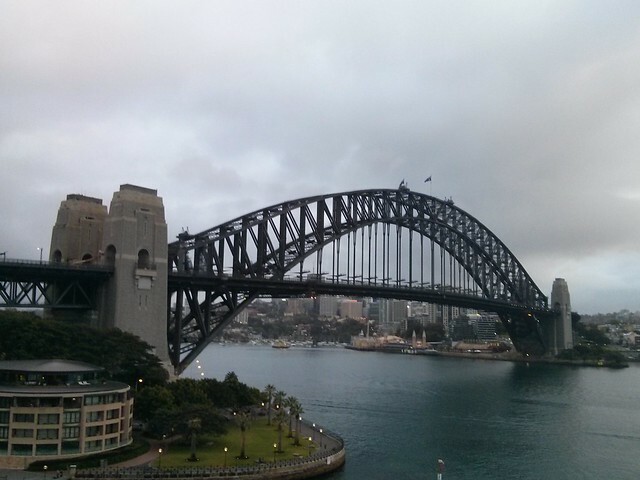 This photo was taken as our cruise ship arrived in Sydney in the early hours of the morning. 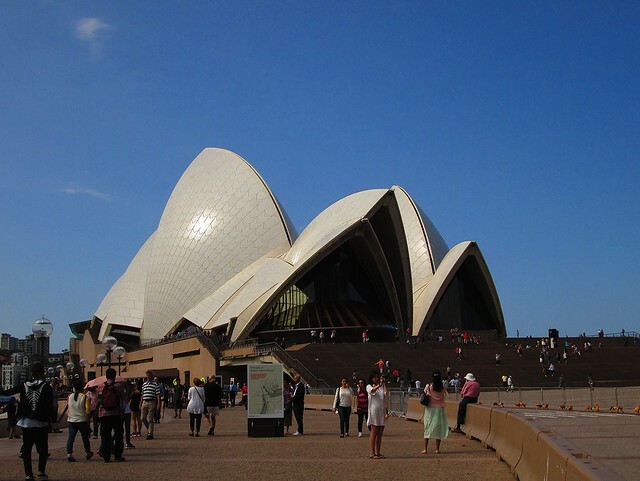 We did not see any kangaroos in our trip, but this landmark is about as iconic as it gets. Unless you count the Opera House of course, just opposite the bridge and the cruise ship terminal – and in much better light. The great advantage of taking a ship is that when you arrive in a city on the other side of the planet, there is no jet lag, and you get to enjoy your visit straight away. On that cruise we also visited Honolulu, Fiji and some of the smaller islands of the South Pacific, which for a lad from East Ham was about as exotic as I have ever experienced. Living now in Beautiful British Columbia we are spoiled for wonderful destinations on own doorstep. Even a short trip to the nearest beach produces breathtaking views. And some of my wanderlust has been tempered simply by the increasing harassment travellers experience just trying to get on a plane to somewhere else. Or even to drive over the border. We are not planning to travel anywhere very much in the immediate future, just to avoid these hassles. When I first saw the challenge for this week I was thinking of looking for one of my gigantic panoramas. 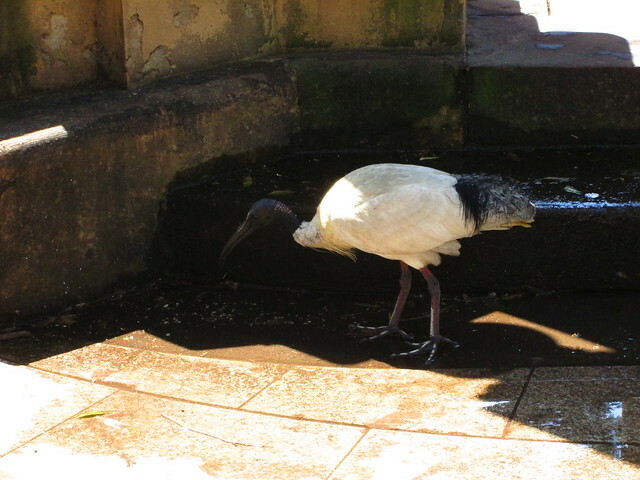 But then as I was scrolling through Photos on my MacBook I saw this little snapshot. We were walking around the Cleveland Dam and Capilano park, when I saw this skunk cabbage emerging from the earth. That does look like a particularly fecund bit of ground – lots of naturally composting plants and detritus from the forest. And that fern is really artistic, don’t you think? We have had almost continuous rain here for months – and the chance to get outside during the brief dry spells is eagerly grasped. Spring has been late, but all around things are emerging and blooming as the warmth returns – if not much actual direct sunshine. We need to keep in mind how much we depend on earth. The fact that we have anything to eat at all depends on a few inches of topsoil and dependable rain. But humans seem to be very bad at understanding that this is very fragile and easily broken. There might be water on a moon of Saturn, but that does not give us any realistic alternative to taking better care of the Earth we inherited and are so lucky to have survived our ill treatment thus far. The little white dots of foam that you see on the surface of the spaghetti squash are where I carefully pierced the skin with a large fork to allow the steam to escape. I have done this many times when cooking it in the microwave. Probably the easiest way to deal with this vegetable. This time, there were not enough holes, apparently, as there was a loud bang. Surprise! Fortunately this was toward the end of the cooking time, and the mess was fairly limited. It was very tasty: served with a meat sauce, of which there were leftovers, which I have just finished for lunch today – with real spaghetti – not another squash or any surprises.